SOUTHAMPTON, N.Y. — It's only Wednesday, but Anthony Montamez and Eddie Canillas have already made the cut at the 118th U.S. Open. About 50 of them, in fact. It's all in a week's work when you're the resident barbers in the players' locker room here at Shinnecock Hills Golf Club. "I'm going to be honest," Montamez, 29, said between customers on a dreary Wednesday afternoon, a nest of curly dark locks near his feet, an antique-style barber chair by his side. "I love Dustin Johnson's beard, man. I've been wanting to shape that thing since I started playing golf." Montamez and Canillas, 23, normally ply their trade at Monti's Barbershop about 20 miles west of here in Montiches. They knew a guy who knew a guy and next thing they knew they had landed a gig this week snipping, trimming and shaping the coifs and mops of the world's best golfers. Scotsman Richie Ramsay popped in Tuesday. So too did Zach Johnson and Steve Stricker. Young Sam Burns had a little taken off the top. Bryson DeChambeau, who no doubt knew precisely at which angles he wanted his hair cut, came at a bad time. "I couldn't get him in right away, so he had to run," Montamez says. 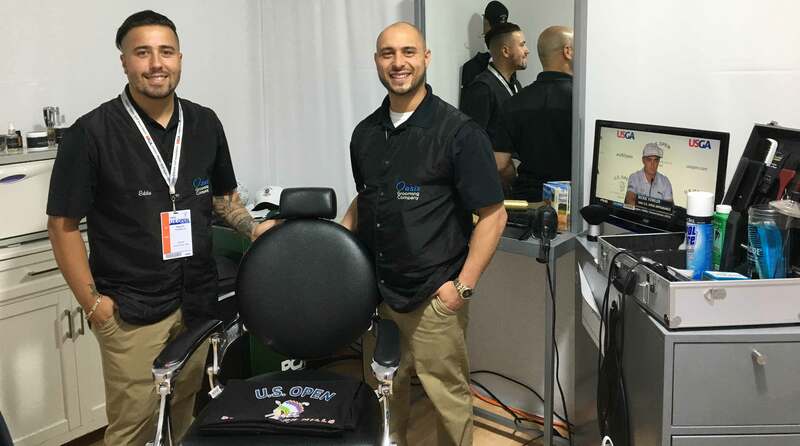 Their humble shop, maybe 10' x 10', is tucked away in the corner of the tented locker room, but, really, the space has all a coiffuer could ever want: wireless clippers, grooming products, bourbon, even a red-and-white barber pole in the corner. On Wednesday afternoon a TV by the mirror beamed in the Golf Channel, although soccer has also been a popular request. As for the cuts? "A lot of the guys are getting it pretty tight on the sides, usually a 2 or 3," Montamez says, as in a two-eighths or three-eighths-inch blade. "Everyone wants clean lines — neck cleaned up, side burns cleaned." Andrew "Beef" Johnston, the Englishman with a beard that's knottier than the Shinnecock rough, has yet to visit the shop but he's high on Montamez's clientele wish list. "I messaged him on Instagram," Montamez says, "but I don't know if he's seen that." Best hair in the field? Who else? The lusciously locked Tommy Fleetwood. "I do like his flow," Montamez says. The cuts are provided gratis to the players, but gratuities are welcome. So far the most generous tipper has been Branden Grace. After a session in the chair, the South African expressed his thanks to Montamez with a three-figure bonus. Sometimes it's Montamez who provides the tips. "I've made a few recommendations to their haircuts," he said. "They've appreciated it, and they've walked out of here feeling good." And looking good, which is important, especially should things go their way on Sunday.